A Steamy Regency Historical Romance. * This novel was originally published under the pen name D.L. Rose. It has been revised (a cleaner edit) and given a beautiful new cover. You can visit my amazon author profile for more details if you wish. Book 1 of the Fated for Love Series. Scandal and treason rock Regency London forcing the privileged daughter of a duke to disappear. After her mothers sudden death, Lady Lillian St. James finds herself in limbo, forced to reside with her sinister stepfather until the new Duke of Cranston, and Lillys guardian, returns from the his travels. When her stepfather is accused of treason she runs from the only life she knew, and with the help of her loyal staff, finds work masquerading as a cooks assistant. She adopts a new identity and immerses herself in the role of servant until she can escape London without her stepfather finding her–and the priceless stolen jewels she took from him! But, her refuge is not as safe as it seems. When she finally meets the master of the house she discovers the new Earl of Redwick could be a danger to her masquerade and her heart. Dominic Coel finds himself as the new Earl of Redwick. But before he can fully embrace his new life and title, he must find the missing daughter of a duke and stolen royal jewels. Dominic is desperate to finish this last mission and begin a life without murder and intrigue, but while he must focus on his duties, he cant help but be distracted by his lovely new cooks assistant. She is innocent to say the least, but her elusive nature and cultured speech drives him to wonder who the real Miss Millie James is. As her masquerade unravels, Dominic begins to separate fact from romantic fiction. His conduct has been less than gentlemanly and now he must face his true feelings as he changes from Lillys greatest obstacle to her greatest ally. Can he save her from her stepfather? Can he deny his own desire to keep her for his own? With the help of their friends, Dominic and Lilly must court further scandal to trap a traitor and risk it all to claim their own happy ever after. 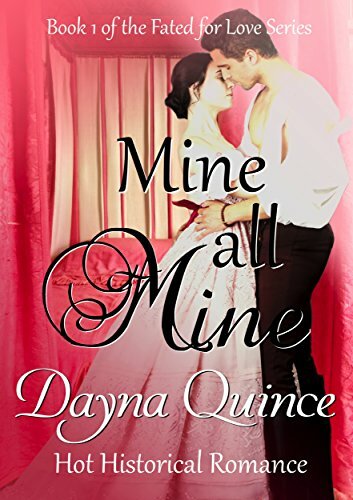 Mine, All Mine is destined to be a Historical Romance Best seller. Click on the Look Inside feature above and take a peek!